← A Picture is Worth How Many Words? 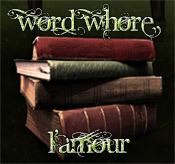 I’m over at Word Whores today, talking about writing what you love. Sort of a twitchy time-frame to write something like that because after finishing up my last batch of edits for A Sliver of Shadow I sorta hate everything I’ve written. This entry was posted in blog and tagged word-whores. Bookmark the permalink. Woo, DA2! Have fun with it! You definitely deserve a break.